SMALL BAG TO CARRY YOUR ESSENTIALS - 2 zippered compartments with several pockets at the front. The back pocket with a snap allows concealed carry or quick access in the emergency situation. This sling bag can contain most of stuffs you need, such as cellphone, tablet, keys, wallet, water bottle, knives, pistol, multi-tool, flashlight, compass, maps, ropes, gloves, poncho, etc. PORTABLE BAG TO GARB AND GO - 3 carrying options (shoulder bag, chest sling bag - back sling bag, hand carry bag) and well-organized items placement serve you in different usage scenarios from everyday use, stroll, camping, hiking, to trip and travel. ONE STRAP FOR COMFORTABLE WEAR - The shoulder sling is adjustable in length to fit people in different shapes and sizes, and there is no limited backward arm movement. Besides, it is easy to remove the bottom clip which can be set for either side preference (left or right hand access). 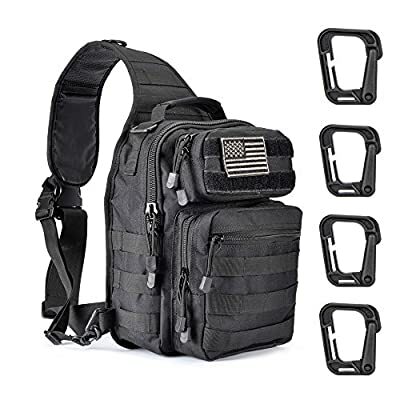 TACTICAL MOLLE SYSTEM - Molle webbing system is ideal for attaching knives, flashlight holster, interphone pouch, water bottle bag and other molle gears. The velcro on the front of sling bag is designed for the pirate patch or your own customized patch. PREMIUM AND DURABLE MATERIAL - The tactical sling backpack is made of sturdy nylon material, lightweight and water resistant. The sling bag comes with a pirate patch.